Our spring semester at Yale is really short and it tends to fly by between work, hibernation, seeing friends, and waiting for the sun to come back out. The week before spring break is notoriously hectic for most students; midterm papers, tests, and mid-semester fatigue take over our minds and bodies. Productivity levels off until it drops once break comes. 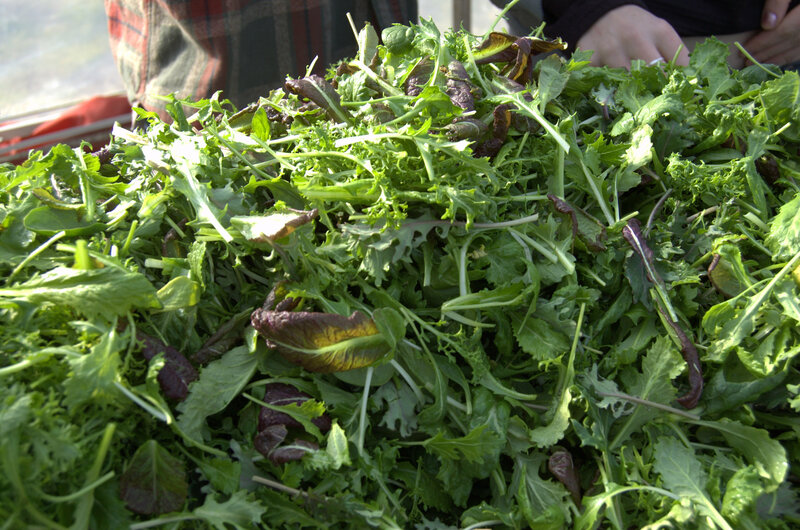 In contrast, the transition from winter to spring for the little greens growing in the hoop houses up at the farm is much lighter and carefree. All they have to worry about is breathing and growing. After some frightful frosts, the more welcoming conditions of late February helped the baby greens reach up towards the sky. And so with the lush greens sitting prettily in their beds, the farm managers decided that the end of the first week of March would be the perfect time to harvest them. I had just finished my last mid-term paper and my body was aching to be outside. After lunch I trekked up to the farm, asked Grace what they needed me to do, grabbed a knife, and started harvesting the cutting kale. Whew! Harvesting is hard work! I’d forgotten what it felt like to work with the ground. It’d been several months since I helped harvest and wash beets at the farm and as much as I was unprepared for the hour I spent crouched along the beds of cutting kale, diligently making sure I’d gotten as many leaves off the stems as I could, I was pleasantly conscious of all the volunteer efforts to get these salad mixes bagged, gifted, and sold. After a period of disconnect with the actual act of farming, I was happy to be reunited with the smells of nutrient-rich dirt, the freshness of the farm’s produce, and the joyful sounds of community. I was also reminded that good, healthy, remarkable foods like salad greens are something I am lucky to have access to and it requires great efforts to grow and harvest them. One of the girls who was working at the farm that afternoon was harvesting the baby spinach. The beds were so thick and leafy that after an hour of conscious efforts, she was only able to harvest about a third of a bed–I was lucky that the leafy parts of cutting kale grew slightly higher off the ground, which made it easier to cut them without worrying that I’d lacerate the poor leaves in half. After I finished collecting all the kale into a bucket, I walked it over to the crop house, where we were weighing, washing, and packaging the greens. I’d gathered upwards of 3 pounds of kale, which was really exciting. 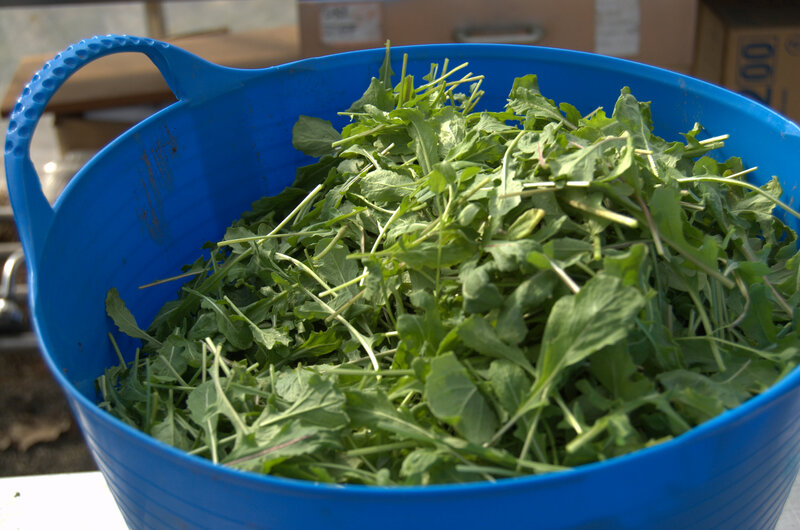 At the end of the day, the farm’s total output of mizuna, kale, arugula, spinach, frisee, and other greens totaled about 35 pounds! 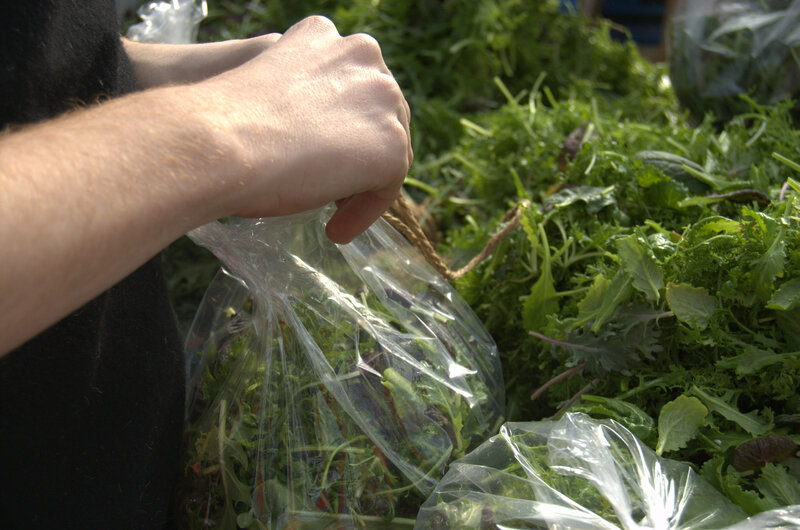 Some of the bags of salad mix went to campus administrators, but most of it was sold to a local sushi restaurant, Miya’s. I was, of course, overjoyed that volunteers were sent home with their own bags of greens as a thank-you for helping to harvest. I was so excited to taste the salad while it was crisp and fresh off the ground. I pulled different types of leaves out individually to taste what each was like on its own. As a spinach-lover, I was completely shocked by how great the baby leaf tasted. It was crunchy, sweet and hearty in a way I’d never experienced with the spinach in the dining hall, or really, anywhere else. And the kale–oh, I fell in love with cutting kale that day! And it wasn’t just because I had been the one harvesting it. I would be more than happy to just eat that kale for breakfast, lunch, and dinner. Like the spinach, it was crunchy and slightly sweet at the end, but it had this great nuttiness to it that made it seem more like a snack than a green. As I carried my bag of mixed salad down the hill back to my dorm, my mind was full of ideas for salad dressings. Which flavors would showcase the incredibly fresh flavors of these greens? Anything that was too thick might overwhelm the tender leaves. I decided to go au naturel, with a mix of extra-virgin olive oil, lemon juice, honey, salt, and pepper. No fancy fruity flavors or vinegars–nature’s own luscious fat, acid, sweetness, and spices would do just fine for my first salad using the day’s harvest. 1. Place greens, nuts, and dried fruit in a large salad bowl. In a smaller bowl, whisk together the honey, olive oil, and lemon juice. Add salt and pepper to taste. 2. Toss the salad with the dressing and crumble the goat cheese on top. 2 Servings 1 1/2 tablespoons palm sugar 3/4 lime 2 cups green papaya, shredded 6 green beans 1 clove garlic 1 1/2 tablespoons fish sauce 1 tablespoon dried shrimp 2 chili peppers 5 cherry tomatoes 2 tablespoons peanuts, toasted Many Asian supermarkets have shredded green papaya and that is what I use. Smash a clove of garlic first. Then add green beans and halved cherry tomatoes. Pound a few times just to bruise the beans and get the juice out of the tomatoes. Add chili peppers and crush them just enough to release the hotness, unless you like your salad really hot. Add the green papaya, dried shrimp, toasted peanuts, fish sauce, lime juice and palm sugar. Use the pestle to push the mixture up in the mortar and the spatula to push it down so that the mixture is mixed well. However, if you do not have a big enough mortar you can crush garlic, tomatoes, green beans. Set them aside in a large bowl. Add dried shrimp, fish sauce, lime juice and palm sugar to the bowl. Add green papaya and mix well. Serve with sticky rice and a sliver of cabbage, green beans and Thai basil.